Today is the day all 362 participants in Lori Anderson’s Bead Soup Blog Party (BSBP) reveal the pieces they’ve created with the bead soup they received. 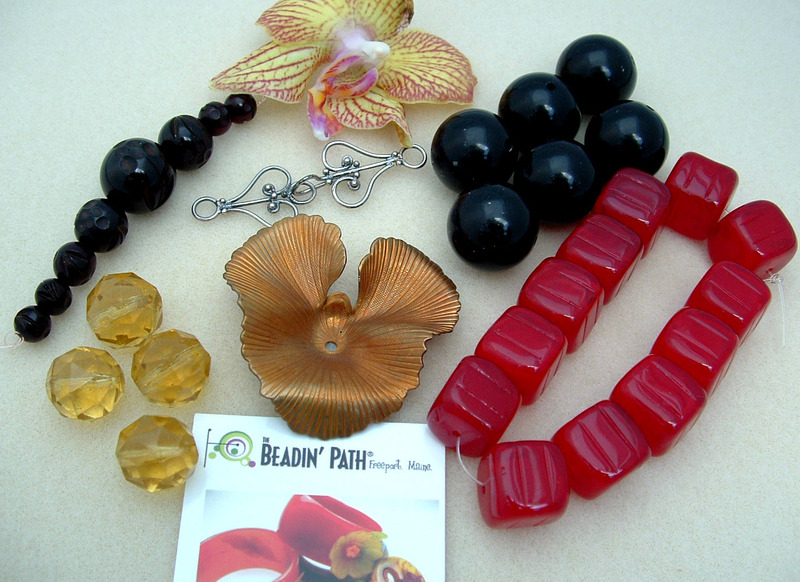 Here is another look at the collection of beads I received from my partner, Heather DeSimone of Beadin’ Path. The 1960’s brass focal sent me on a tour of vintage clothing shops and collectible markets to get a sense of the era. At a shop in Nashville, I met a couple of stylish sisters who were selling their collection of vintage Hermes silk scarves – iconic pieces that would have adorned the necks of the likes of Grace Kelly, Audrey Hepburn or Jackie O. Too dear a price for me, but one in their collection, still wrapped in its original tissue paper, inspired my color palette (black, gold, cream and silver) and my design element – graceful leaves. Black and gold are always sophisticated, and I find that cream, often thought to be a cool color, can warm up a palette, the way these Swarovski pearls (in light rose cream) help to showcase the intricate design and detail of the lily focal. After investigating several dozen leaf designs I settled on a Russian-inspired variation from Sheila Summers. 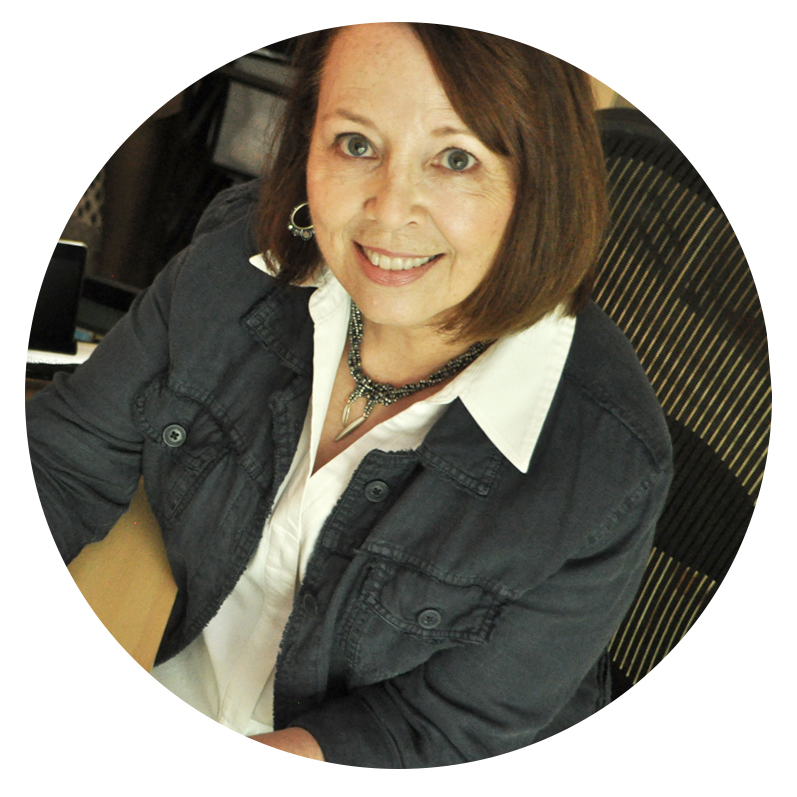 Her free tutorial is precise, well-written and very easy to customize. I wanted my choker to be as easy an accessory as a scarf – just wrap it around your neck and instantly brighten your day – without having to think about it again. To that end, I needed to ensure that the peyote tubes, supported by a 3mm buna cord, would stay put – no shifting or twisting or spinning of leaves. So I zipped the tubes on the cord, and found that if I switched to a size 10 beading needle, I could stitch right through the cord, anchoring each tube in place. The necklace is finished with Heather’s fabulous carved jet beads and silver clasp, making the closure as elegant as the focal! Warmest thanks to Lori Anderson for hosting this extraordinary online party! You’ll want to check out what Heather and the other 360 party guests dreamed up by clicking here. I love this Karin! Great use of the vintage focal and I love that you did research first, that's awesome! I love this. Very gorgeous and beautiful work. wow! some of you people are so talented, and you would fit into that category...like wow!!! Lovely necklace! I really like how sophisticated the colour combo looks. And the design with the sweet leaves and "colour sections" on the cord is fab. Great job! Can't begin to tell you how much I love this necklace. Thanks as well for the link and the tip about sewing to the cord. The colors you chose are wonderful, and the design is just superb! What a lovely piece you made! It is just perfect for that focal! Beautifully designed! Wow but that's pretty, and I love the "Backstory"! Well done! That is amazing! Great bead work! That is absolutely gorgeous. Stunning. Very feminine, yet elegant. I've never been able to work with seed beads like that. Not enough patience I guess. And I love the vintage feel. Stunning creation...love the bead work! Nice job! A wonderful piece! You have been so busy - this necklace is great! Wonderful! You have created a terrific piece of wearable art. I like your use of color and texture and the pattern is stunning. Thank you for sharing your artistic process along the way. Cheers! That is very glamorous old Hollywood gorgeous! Gorgeous! Such detail, it is very sophisticated. Such a glamorous and sophisticated necklace... I absolutely love it. Thanks for visiting me Karin. I love the necklace you have created it is so elegant! Oh wow! That's just beautiful. The color palette and style are just ideal for that pendant. You really did an outstanding job and seriously put in a lot of thought and time. It shows! You are a Tennessee girl too! I live just north of Nashville in White House. I adore vintage so your brass focal spoke to me,I think you did an amazing job with your soup, the attention to detail is wonderful! I am so sorry for being so late my computer was resisting too labor intensive:^)Very nice designs. This is one of the most beautiful necklaces I have seen on the blog hop so far. I so admire those who can do detailed beadwork like you have done on this piece (my eyes don't work that good no more). I could definitly see it gracing the neck of Audrey Hepburn. I am crazy about this - one of my favorites on the hop (of course, I am a beadweaving fanatic) - love the choker! Very creative! That is fabulous. Your seed bead work is incredible and really sets off the focal. Your necklace is incredible - just stunning! What a lot of thought, consideration and time you have given to this beautiful piece. Outstanding..and just SO elegant. Beyond amazing, what a gorgeous necklace! This is my favorite of all the blogs I have hopped. I am in awe of your bead work, you really designed a fantastic necklace. I love, love, love the leaves (leaves are my favorite)! I so wish I had your talent at bead work. I attempted to make a bracelet and several hours later I had a rectangle! this piece is amazing! i am also a beadweaver and love your peyote tubes and your leaves! enjoy it! VERY pretty, and VERY unexpected :) Excellent job! What a beautiful necklace! 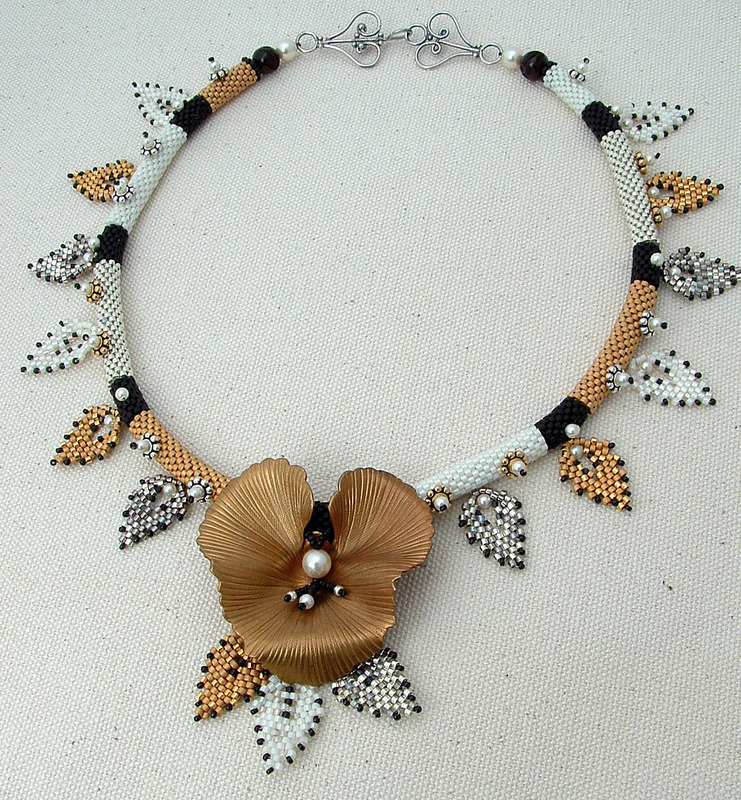 I am not really one for seed beads but this is something that I would happily wear. Ohhhh! Stunning! Elegant and beautiful :) What a way to showcase that focal! As a fellow weaver, this necklace makes me very happy - it's understated and elegant and beautiful. 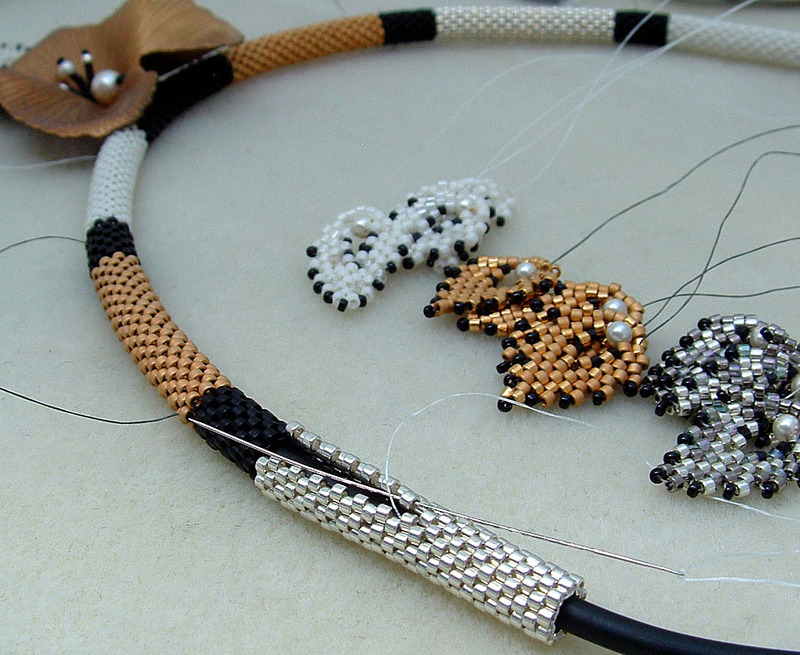 And thanks for the great tip on stitching the peyote tubes to the cord -- I'll have to file that away for when I finally finish looking at all these blogs and can get back to the bead table! Beautiful! Your beadwork is amazing! You created a really classy, elegant necklace. Very, very nice job with the beads you received. your beadweaving is breathtakingly beautiful! what an elegant necklace! just gorgeous! A glamorous piece in a great palette! Look at all that bead work wow! I'm in awe. Gorgeous soup + talented designer = Gorgeous necklace! Soup-er job! It is gorgeous, a work of art! What wonderful workmanship, what a grand design. I love everything about it. Beautiful! And every bit as elegant as you intended. I always enjoy seeing the work of other seed bearers. Thanks for including the process photos. I've covered cording with peyote stitch before, but always worked in the round rather than flat and then zipping it up as you did here. Very sophisticated and elegant - great soup! Your piece is very elegant. Beautiful beadwork! What a stunning and elegant necklace, your clasp is perfect for the design- love the colors!! Amazing! Just lovely. I love bead soups that go down the seed bead road. Congrats for a terrific design and execution! Wow, that is totally gorgeous! It makes me all warm and fuzzy to see something so beautiful made using my tutorial!